It's been a very cold winter in Korea. It's not such a bad thing because it gives you a very good reason to sit in front of a hot grill as you warm yourself - a mini fireplace right in front of your face - while meat grills away~ the sound, smell, and warmth... sounds pretty perfect for a -15 C or 5 F night. 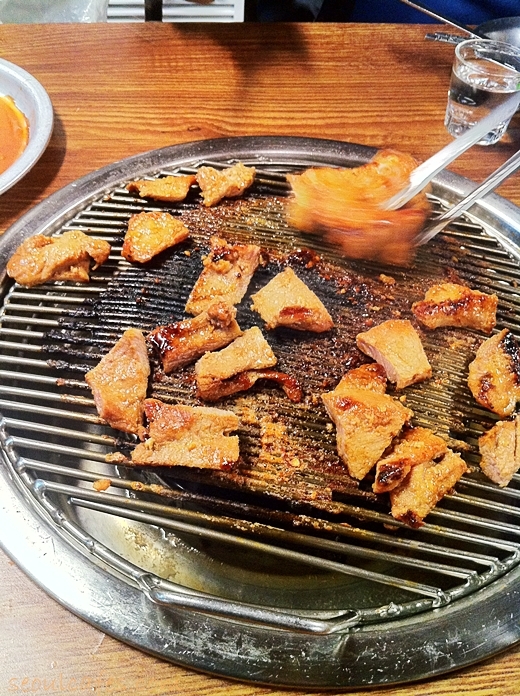 We headed to a famous grill restaurant called CHOI-DEH-PO to call it short - but the Korean name is 마포진짜원조최대포. They have been around since 1955 and currently is one of the higher rated rated restaurants in Mapo. Only a few blocks down from our home - we bundled ourselves for a walk to the restaurant. 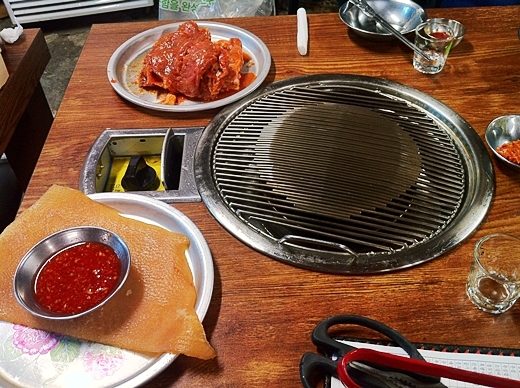 The night was cold and we were ready for some cozy grilling, tasty meat & soju. 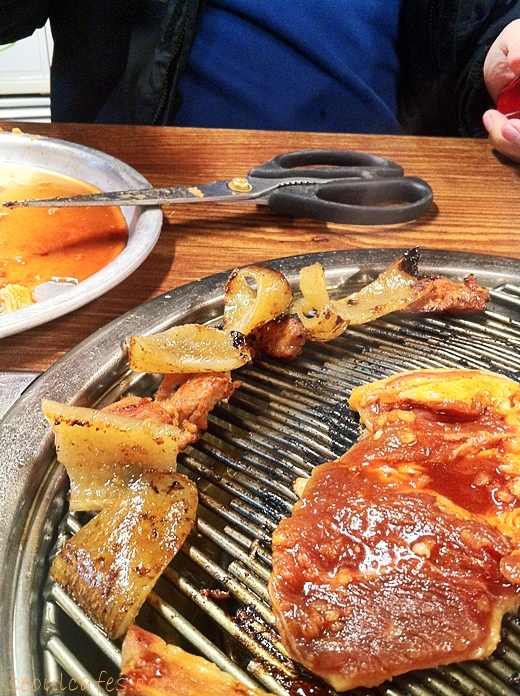 There's something about Soju & Korean meat that goes well together. 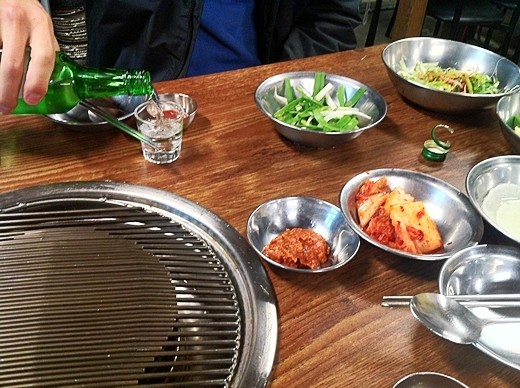 I can't have meat without soju. It's like having pizza & coke. 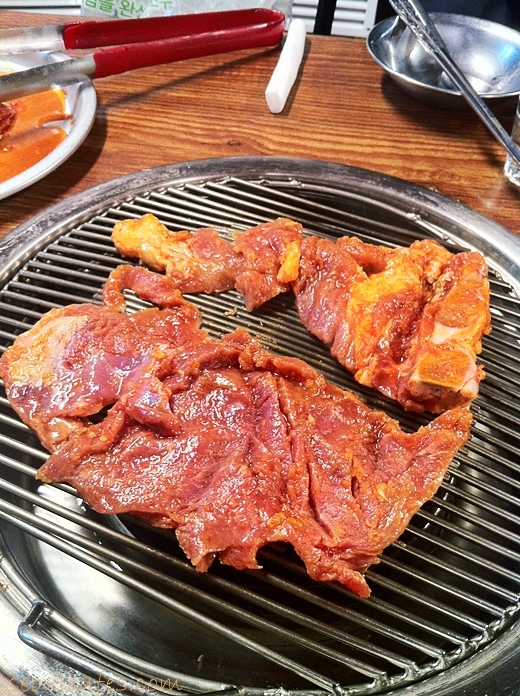 We ordered 2 servings of "pork galbi"(their specialty) and "pig's skin". 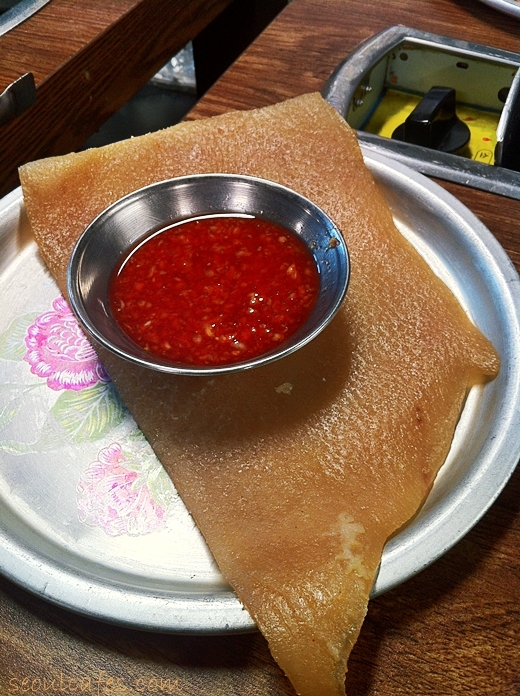 The "pig skin" comes like so - if you're not used to seeing "skin" as meat - well here it is. It is a surprisingly clean looking "skin" - no hair sticking out or weird smell. This is highly popular among the ladies because "it's good for the skin". I'm a sucker for anything good for the body (with limitations). 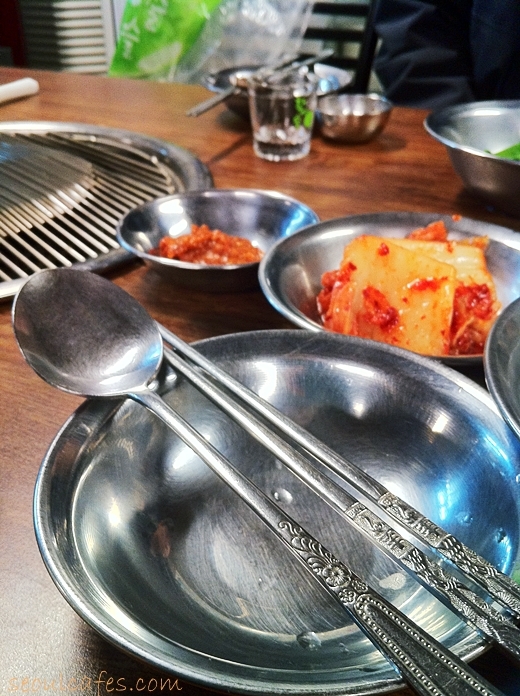 The table setting came with the a few basic side dishes and "ssam" veggies, which are all you can eat and self serve. You can grab more on the corner of the restaurant. We started our grilling like so, with the meat on top - being careful not to char or "blacken" the meat. The grills come in many different shapes, sometimes square, round.. This one was a bit hard to work with - since you'd have to be careful not to drop the meat on the bottom. Everything was great - except one thing, the restaurant was freezing!!!... They only had "fan heaters" on the wall, which made the air as not any different from the outside. It felt like we were grilling outdoors. We both had our winter jackets on - feeling really confused as to why we were paying to grill away like so in such a cold day in a cold restaurant. There was not much we could do, except move... to another table next to the wall heaters, but we didn't feel like we wanted to waste our remaining body heat away. We grilled away and tried to forget how cold we were. Whining aside, the meat looks great on the grill. We grilled the "pig's skin" together. 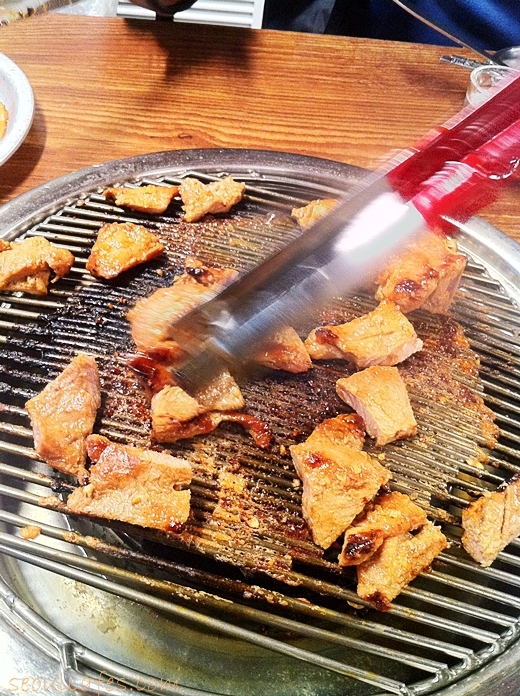 A staff told us not to overcook it since it's already been "cooked" or it will get too hard. 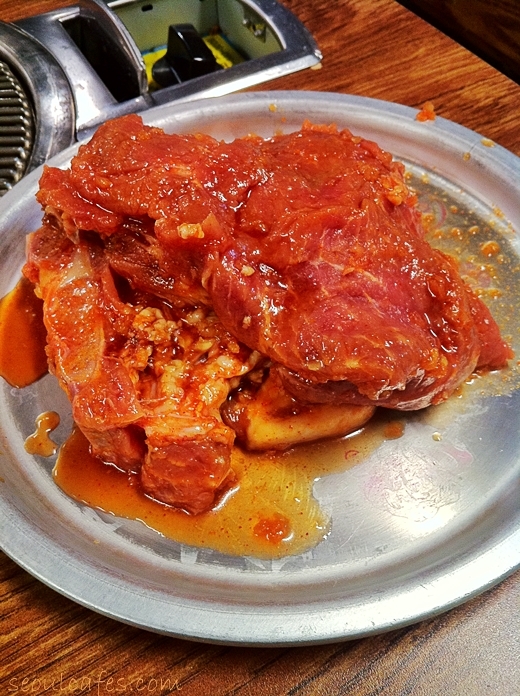 The skin transformed into a soft gelatin like meat as they softened up on the fire. 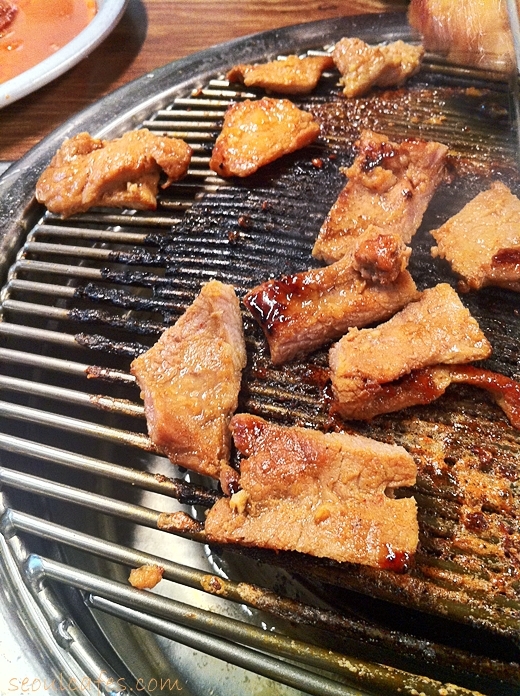 The meat tasted great - the pork galbi was definitely marinated in enough garlic. It was very good - except that the only thing I do remember most about this restaurant is that it was COLD and uncomfortable and we hurried and ate away. I hate to remember restaurants this way - but for a freezing winter day - this was not ideal. I don't know how anyone managed to eat there that night. There were enough people - some also dined inside the "ondol rooms", which was probably a better idea then. I even over heard a staff say that we left because we were cold! We did, then do something about it! The restaurant is OLD and it's about time it gets some work done to make sure their restaurant doesn't feel like the outside temperature during winter. Really disappointing. I was expecting so much out of this place. The tables are old - the interior is old - let's just say not much has changed since 1955? You also have to "grab" their attention for service. It's 2013 now and I think it's time "relaxing and dining" comes into place. I don't want to scream for an additional order, or haul my own water, or feel COLD in the winter as the only heat is the grill in front of me - really old style restaurant. If you like this atmosphere, that's great, but not for a night "for dinner" - but more like "drinking and getting wasted" kind of restaurant. LOCATION: Gongdeok station - exit 5 - walk out to the main road on your left and on the first lil corner on your right is the restaurant entrance. Open from 11am~midnight. ***They will not accept customers after 11pm.